In the Media | Materials and Writings on the Decision to Run | Press Releases | Ralph Nader to appear on "The Tim Russert Show"
Click here to Receive the Set of Unreasonableness! Ralph � you are being unreasonable. How often did Ralph Nader hear this during the 2004 campaign? I want your ideas about how to make this idea of Bookshakers work with more people. A Bookshaker is a person who obtains a carton of 24 books, with the same title at a sharp discount, and then gives them away one by one to friends, relatives, co-workers or local libraries in the community. Oh, what joy to give and receive! Try it and see. If you have any brainstorms, send them our way. In the meantime, if you participate in this Bookshaker offer and actually give them away, you'll likely come up with some ideas about how to spread this book multiplier and get people reading and thinking more. So, let's start with five more titles each with 24 copies in a carton. Each carton is yours for $100 to help reduce our campaign expenses (how did you guess?). 1. Plato not Prozac by Lou Marinoff, Ph.D. One of the founders of the movement called Philosophical Counseling, Professor Marinoff draws on the great philosophers of history to provide alternatives to traditional therapies, which often include too quickly drug prescriptions. A down to earth philosophical guide to help people solve their most common everyday problems. 2. Money From Thin Air by O. Casey Corr. This is the amazing story of young, entreprenurial, Craig McCaw, who "created a cellular communications empire from the disarray of his father's failed cable business and went on to sell it to AT&T in 1993 for a stunning $12.6 billion." A very engaging, absorbing writing style. 3. 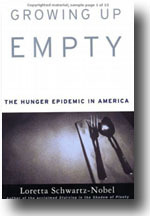 Growing Up Empty by Loretta Schwartz-Nobel gives the shocking story of life on the other side of the tracks--the hunger that still plagues millions of impoverished Americans and their children. This gripping book is described as an eye-witness account of a worsening epidemic of human suffering that need not exist. "Skillful investigative reporting and a novelist's sympathetic and humanistic eye for detail." 4. 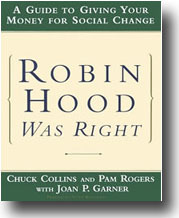 Robin Hood Was Right by Chuck Collins et al. "Change, not charity," is the way this co-director of United for a Fair Economy, urges people of means to direct their charitable contributions toward addressing "the root causes of social problems," rather than reinforcing the status quo, dependency and control. Lots of detailed suggestions. 5. 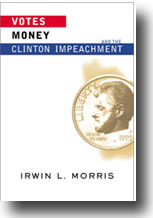 Votes, Money and the Clinton Impeachment by Irwin L. Morris. Professor Morris argues that "our current system of campaign finance enabled House Republicans to impeach the president and provided them with the means to retain their majority in the House." Even though a majority of the people in their Districts opposed these impeachers' effort, the lure of money for politics prevailed. There they are. Each carton for $100. Watch how people express themselves when you give them a book. They've probably never met a Bookshaker before. Their reactions and your imagination could give us more ideas on making the Bookshaker a spreading vehicle for literacy and civic awareness. If any one of you graciously decides to purchase all five book cartons, please give me your phone number so I can call you --the super-Bookshaker gifter--directly and get your thoughts. Click here to receive this Special Offer! Featured Item: "Huey Long" and "Wealth and Our Commonwealth"
Great not only as an ice-breaker at Nader/Camejo 2004 House Parties but also as a primer on the issues Ralph Nader is trying to bring to bear with his presidential campaign, the Spoiler card game is packed with fifty-two brain-teasers sure to make anyone take stock of what their vote truly means to them. Spoiler is a pocket-sized crib sheet on the state of American politics that independently-minded and inquisitive citizens can't affor to do without this year. Cards are Poker-size (larger than bridge), very high quality (we spared no expense) and made in the USA. Ralph puts the real issues on the table in this "virtual" debate with fellow candidates Bush and Kerry. Using the actual questions from the Presidential debates, Ralph discusses his plans for pulling our troops out of Iraq, solutions for the energy crisis, helping the environment, using tax dollars sensibly, and giving all Americans a living wage. Made in the USA. If you experience any problems with an order or with the webstore, please contact us at (202) 265-4000. If you are interested in purchasing merchandise in bulk please call our merchandise representative at 202-265-4000. We have limited amounts of merchandise left. If you wish to mail a check for your merchandise purchase, please call us first at (202) 265-4000 so that we can reserve the items that you want. You can also purchase merchandise with your credit card over the phone by calling (202) 265-4000. Help us wind down our campaign debt today! Unsubscribe here, visit here for information about our mailing list(s).